LYRASIS and DuraSpace announce their intent to merge, forming a robust new home for Community-Supported Programs and Services. 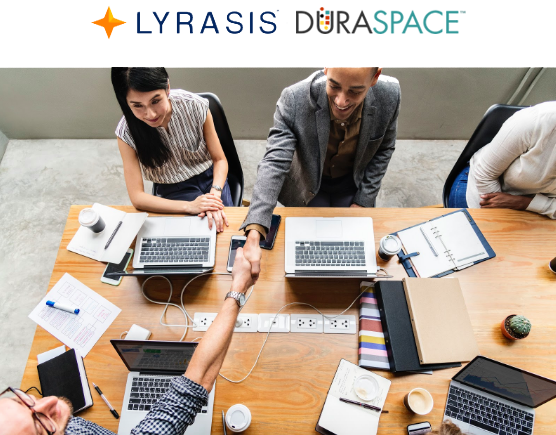 LYRASIS, an innovative full-service technology and services nonprofit, and DuraSpace, which specializes in open source technologies, plan to join their world-class 501(c)(3) nonprofit teams in 2019. LYRASIS is a recognized leader in building and delivering solutions to academic and public libraries, museums and archives. DuraSpace is a best of class team providing leadership and innovation for open technologies used by academic, scientific, cultural, technology and research communities.